The Panther Grouper is a stunning, large predatory fish. 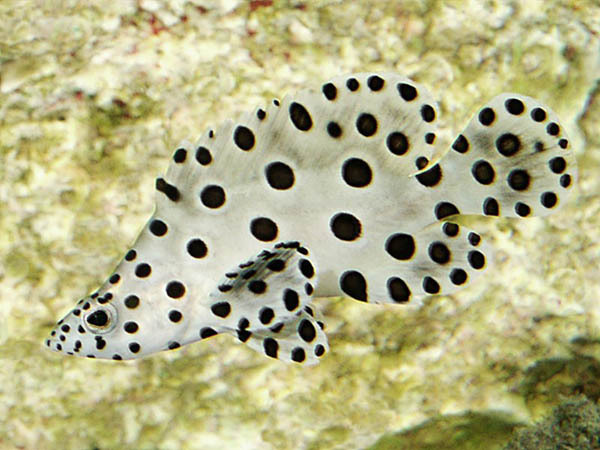 This extraordinary-looking Grouper is also known as Humpback or ‘Polka-dot’ Grouper for its striking colour pattern of bold black spots against a white to creamy-grey body. 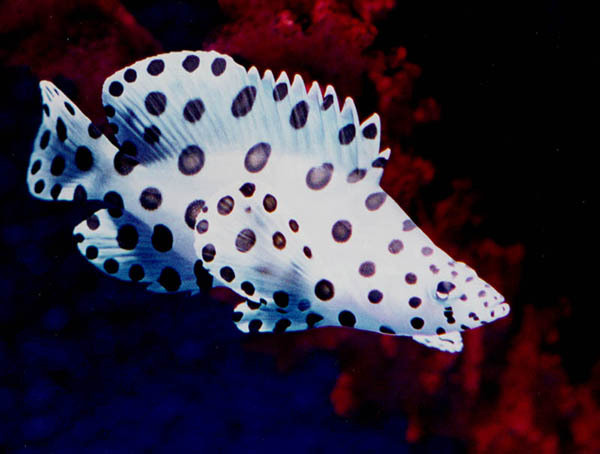 Juveniles display fewer, larger black spots, against a bright white background. These black spots become smaller and more plentiful as the fish matures and the white becomes more greyish. That being said, even as adults they are still a beautiful and impressive fish. When disturbed, individuals may develop a ‘fright colouration’, in which large brown blotches colour the skin. This unusual fish is also unique amongst the groupers in having an elongate, slender head that rises sharply at the nape of the neck, giving the species the distinctive ‘humpback’ appearance. The long dorsal fin begins at the top of this ‘hump’ and extends almost the entire length of the body. These large and graceful fins together with its body shape and colouration serves the purpose of camouflage. The Panther Grouper originates from the eastern Indian Ocean and the western Pacific Ocean and can be found from southern Japan in the north to southern Queensland, Australia in the south. It inhabits a depth of 0-40 m and is an appreciated food fish throughout most of its native range. The Panther Grouper is no stranger to the aquarium hobby and has been around for some time. 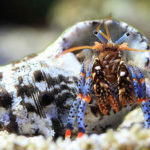 Their striking appearance, along with their unique colouration and pattern, made them an instant hit with marine aquarists. What has maintained their popularity throughout the years is the ability of the Panther Grouper to adapt so well to aquarium life. Panther Groupers are relatively slow swimmers; they prefer to cruise about the reef looking for possible meals and patrolling their territory. Due to their large size and relatively high bio-load, the Panther Grouper requires a large aquarium with excellent biological, chemical and mechanical filtration. The Panther Grouper is very popular and periodically available; if you have patience it shouldn’t be hard to find this species for sale sooner or later at your local fish store. The Panther Grouper lives a long time (with proper care) and is a very hardy fish. Many consider it one of the easiest marine fish to care for and adult specimens of this species are often used to help cycle new aquariums. It is important to note that the Panther Grouper is not for just any aquarist and one must be very careful before considering purchasing one. 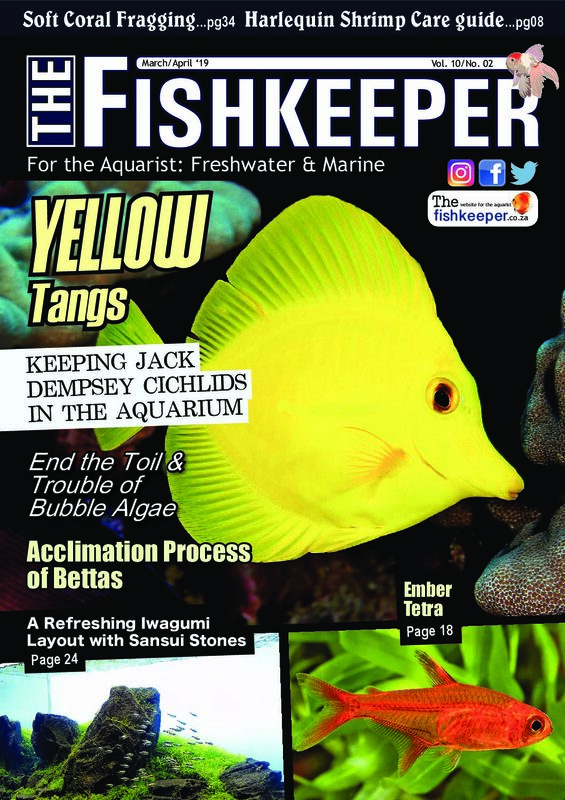 I am sure many eager fishkeepers have been lured into buying one due to their beauty and the fact that they are mostly sold when they are small, around 5-10cm in size. They will soon find out that it will grow fast and sooner or later your other smaller fish will be disappearing! 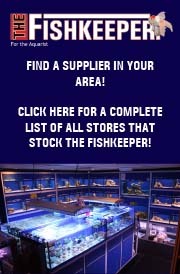 So, first things first, you need to have a large marine aquarium that is a minimum of 400 litres. 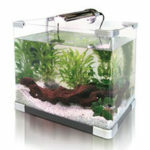 Bigger is always better and for long-term success an aquarium around 800 – 1000 litres will be best. You will therefore need to keep Panther Grouper with other large aggressive or semi-aggressive fish. As these fish can consume large amounts of meaty foods you filtration will need to be good. 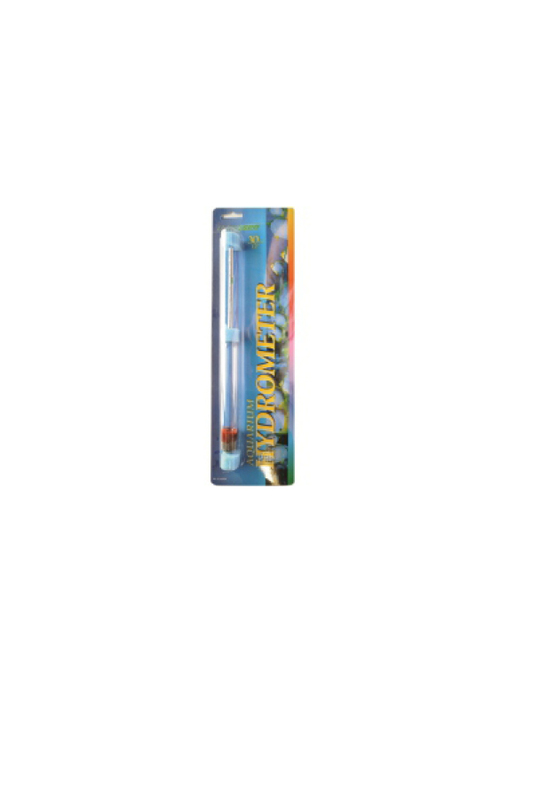 A good quality large protein skimmer along with frequent water changes will do the trick. In the wild, this species swims along the reefs hunting for prey and you should keep this in mind when decorating your aquarium. They prefer an aquarium with suitably sized hiding places in caves and overhangs as well a lot of open space to swim in. They appreciate a few shaded areas in the tank where they can rest. They have no preferences in regards to bottom substrate. They are best kept in a “fish only” or a “fish with live rock setup”, since they will devour the mobile invertebrates of a reef aquarium. Ideal conditions for the Panther grouper is pH 8.1-8.4, salinity 1.022-1.025, and temperature 24-26°. Panther Groupers should be housed with other large fish species that have similar temperaments. Tankmates for the Panther Grouper include some Tangs, Wrasses, Angelfish, Triggerfish, Eels, Sharks, and Lionfish. The Panther Grouper is a predator of smaller fish and some ornamental invertebrates, so caution should be exercised there. The Panther Grouper is a highly predatory fish and will eat anything that it can fit into its mouth. Never keep it with small fish like damsels or clowns as they will end up as food sooner or later. This species is not reef safe as it eats invertebrates, but it can be kept with corals and anemones. If they can’t eat it they will leave it alone; the Panther Grouper is relatively mild tempered and ignores just about anything that it can’t eat. It is much less aggressive than most other grouper species. They can be kept with most fish species that are large enough not to be eaten. 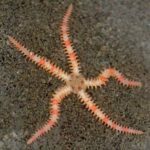 They are easy to feed and many (but not all) individuals will accept marine pellets after training. This fish should be feed a varied high protein diet. A good diet can be based around frozen shrimp, crab and mussel meat (can be bought in the grocery store) that is complemented with other live and frozen food. They appreciate a feeder fish every now and then but should not be fed only feeders as such a diet won’t give them the nutrients they need. They are always hungry. Panther Groupers should be fed meaty marine foods including marine fish pieces, squid, clams, shrimp, prawns, silversides, large krill or similar marine meaty preparations. It is important to only feed them raw marine foods as precooked marine foods from the grocery store contain preservatives that are harmful to the fish. 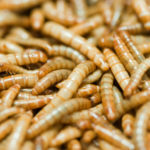 There are a variety of frozen meaty foods available including silversides, clams, krill and squid, as well as freeze-dried and pellet foods made especially for larger marine carnivores. 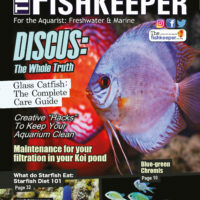 Goldfish or other freshwater feeder fish are not a good food choice as they lack the nutrients that the Panther Grouper needs to maintain a healthy immune system. It is important that groupers not be added to an aquarium if a grouper is already established in it. Groupers will claim the entire aquarium as their territory (unless the aquarium is extremely large) and will aggressively attack other groupers or similar species if they are added to the aquarium. 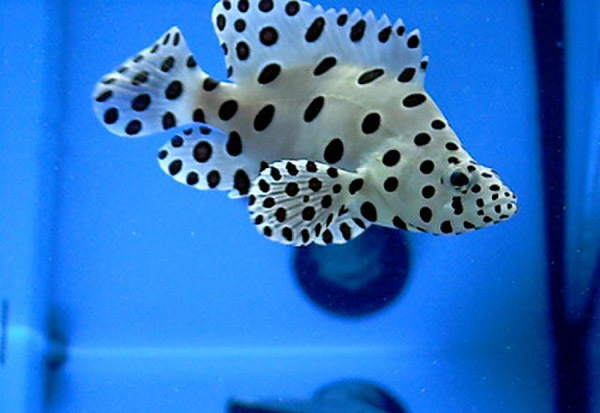 In order to keep multiple groupers within the same aquarium, it is best to add them at the same time while still juveniles. 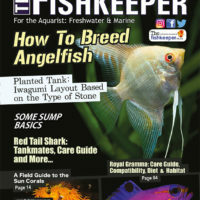 For aquariums that already have a resident grouper and the aquarist wishes to add another grouper specimen, the first group should be removed and placed into quarantine, the aquarium aquascape should be changed considerably, then add the new grouper specimen, with the original grouper then being added back to the aquarium a couple of days later. While this is not a guarantee for success, it will greatly enhance the odds of the two groupers finding a balance of territory and co-existing peacefully. 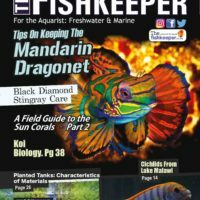 I trust this article has given you a better understanding of this species, and as long as you have a large tank with good filtration this fish can even be kept by beginners in a fish only or predator aquarium. If given the proper environment, a Panther Grouper really makes a stunning tank inhabitant and it will be hard to take your eyes off it as it makes its way around your aquarium! While not picky eaters, panther groupers are definitely messy eaters.